Dinghy racing is an exciting and competitive sport that appeals to the fit tactical and speedy, and rewards the safety conscious. Dinghy racing is the competitive sport of sailing dinghies. Races take place on either inland or coastal waters and can include dinghies of all shapes and sizes from small and slow craft to lightweight, high speed designs. The sport is governed by the International Sailing Federation (ISAF), who maintain the international rules of sailing, and within the UK it is regulated by the Royal Yachting Association (RYA). 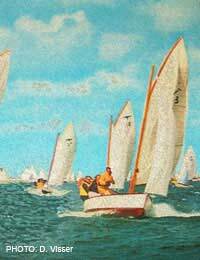 As the younger more modest cousin of yacht racing, dinghy racing offers similarly competitive sailboat thrills but with fewer of the risks and difficulties associated with yachting. The safety of any vessel largely rests on the skills and experience of its crew. If a sailor has been well trained and educated in the regulations and dangers of seas and inland waterways, and acts in a responsible manner, then there is little need to worry about safety on the water. Before beginning to race a dinghy safely it is essential to first learn the core skills of dinghy sailing with an introductory RYA-approved course. Level 1, 2 and advanced RYA courses are available and cover such basics as boat handling, theory, navigation and seamanship. They also feature safety advice and demonstrations, including how to right a capsized vessel. With professional instruction it is relatively easy to pick up the basic sailing skills in a few hours and be gliding across the water within a week. When the sailor feels confident with their new skills and wants to try them out in a race they should look to join a local sailing club with a regular programme of racing events. Many clubs provide novice races so that beginner racers can compete with similar abilities. For those sailors familiar with basics of sailing but still not confident about competing in a race, RYA have devised a special course. It is taught at sailing clubs and centres across the UK and gives students the confidence, safety know-how and skills to glide across the finishing line. Tutors will instruct such subjects as to how to maximise boat speed and how to outwit opponents. During standard club racing there is always at least one safety vessel stationed on the water, which maintains radio contact with the race officer on the shore. The job of the race officer to keep an eye out for any boats in difficulty and upon finding any, informing and directing the safety boat accordingly. Such safety cover is normally maintained in the waters around the club both in and out of racing events. A handicap event is a race involving a mixed fleet of competitors, from different boat classes to different ages and abilities but where each competitor is handicapped accordingly, thereby allowing every boat an equal chance of winning. This system allows sailors of any age to be competitive from children as young as ten. Warm and protective clothing and sunscreen are all essential for any boating activity in the open air. However a dinghy racer’s most important item is the buoyancy aid. This is a jacket style aid designed to keep the user afloat whilst they participate in a lively sporting activity unlike the life-jacket, which is an emergency device intended to save its wearer from drowning. It is now commonplace to know what to do in a ‘man overboard’ situation. Recent statistics show that approximately 67% of Emergency Services launches for man overboard incidents are for pleasure crafts. The RYA includes basic man overboard procedures as part of its boating courses. This not only includes instruction on what to do if passengers falls overboard but, more importantly, how to prevent the situation happening in the first place.